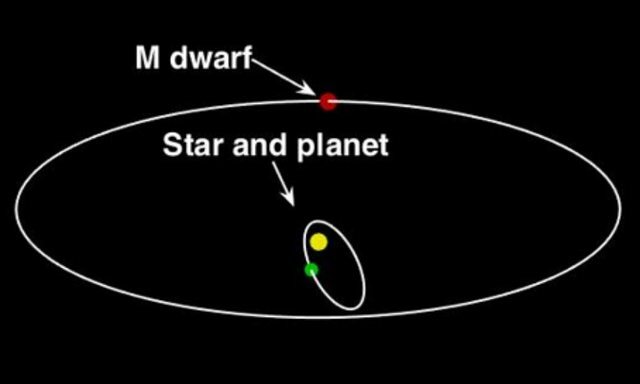 A team of scientists has discovered unusual planetary system composed of a monster planet ‘dancing’ dangerously with two stars — a sun-like star and a dwarf star — at 127 light years away from us. The super planet was first discovered in 2011 with the HARPS orbiting a main sequence star like our sun called HD 7449. The planet, dubbed HD 7449b, is about eight times the mass of Jupiter and has one of the most eccentric orbits ever found. We define the orbital eccentricity or the eccentricity of an orbit as a measurement of how much the orbit deviates from a circular shape. For example, Earth has a very low eccentricity of .017. On the other side is the dwarf planet Eris, a member of a high-eccentricity population 0.44068. In our solar system, Venus has the least eccentricity of any planet, .007 – with a nearly perfect circular orbit. HD 7449b has an eccentricity of 0.82 — a really eccentric orbits, one of the most eccentric orbits we ever observed. It was known earlier that its high eccentricity indicate that the planet is being affected by other nearby objects but the factors causing its orbit was unknown, until now. The new study, published in The Astrophysical Journal, reveal that HD 7449b’ great eccentricity was caused by something bigger than the planet also resided in the system. A dwarf star, as they say, a small star with a mass that is 20% of the Sun’s. The query was: is it a planet or a …? stated Timothy Rodigas ~ lead author of the study. To reply the query, Rodigas and his team used the Magellan adaptive optics (MagAO) instrument suite to directly image the entire planetary system. Massive planet HD 7449b dancing with a Sun-like star and a dwarf star.©Timothy Rodigas. The dwarf star orbits close to the primary star, HD 7449A, just 18 astronomical units (AU) away. Not long ago, we thought that binary star systems were incapable of hosting planets, but in recent years, the number of exoplanets detected with 2 stars has been growing. Though, this system is one of the very few systems that consist of a star similar to the Sun, a dwarf star and a giant planet between them. Moreover, what’s even more unusual is the planet HD 7449Ab which is by far the most massive and has the most eccentric orbit. The researchers believe that the dwarf star and the planet have been gravitationally influencing each other for millions of years. The scientists will continue to watch the system over the coming years hoping to understand how such a weird system could have formed.